Hopping over from BCD. That looks delicious! Mmm.. I think I need some of this, this weekend! Thanks for linking it up to Foodie Friday. And thank goodness it has finally cooled off here in SC!! I've actually been having to run the heat in the car while taking Han to school! Okay....YUM!!! I seriously could eat an entire batch up! haha some of my 2 fav ingredients...Ranch and Salsa! Thank you oh so much for sharing your creation at my Fabulous Friday Find party!! Have a great weekend, sweets! 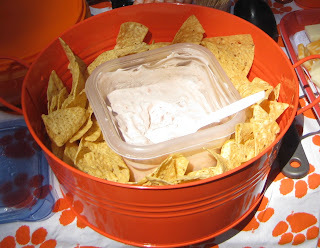 Wow we have used the sour cream and Ranch dressing before, but never added the salsa. Will have to give it a try. Your ranch salsa dip sounds wonderful. Looks like you had a lovely day! I'm visiting from The Speckled Dog. Yummy! I've never thought of putting the two together. Thanks for sharing. We went to Clemson a few years ago to see Tech play. It is a beautiful campus, and the fans were all very nice to us. I'm going to try your dip at Tech's next game, Oct 9. Good to hear Grammy Goodwill! I hope you enjoy the dip!! mmmmm sounds so good! I love your blog by the way, and your background is sooo cute!